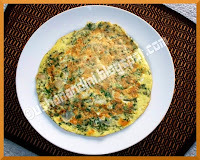 This is a South Indian snack which can be made quickly and is great to munch on any time of the day. It is nothing but peanuts spiced up a little and deep fried to make a crunchy snack. It stays fresh for a week when stored in airtight containers. Dry roast the peanuts for about a minute in a pan or microwave them for about a minute. this makes them crunchy. Mix the chickpea flour, rice flour, red chilli powder, salt and hing together. Ad a little water to this and mix to make a thick paste. It should not be very runny. Heat oil in a heavy bottomed pan and when it turns hot, slowly mix the flour mixture and peanuts together and add a little to the oil very carefully. Simmer. Allow them to turn golden brown on all sides. Slowly remove them with a slotted spoon and drain on paper towels. Do the same to the remaining peanuts. Once again I was paired with Min for Taste and Create for the month of October. Taste and Create is a food blog event started by Nicole of For the Love of Food, in which participants are paired with each other and asked to create a recipe from their partner's blog. I was paired with Min in October 2008 and I made these soft homemade breadsticks. I had a numerous delicious recipes to try from her blog and wanted to try as many as possible. But since I was out of time, I could make only one of her recipes. I tried out these pecan sandies. And it was an instant hit at my place. I have always loved the pecan sandies from the stores, but I find that these are best homemade, being made more healthier and without preservatives and artificial ingredients. And do go and check out Min's blog for some amazing recipes. I loved her baking section especially. I pretty much follwed her recipe for the pecan sandies, except that I toasted the pecans for a few minutes. Toast the pecans in a pan on medium heat for about 8 to 10 minutes. you could even toast them in the oven for about 10 minutes. In a large bowl, beat the butter and sugar together until soft and fluffy. Slowly add in the salt and vanilla. Gradually add in the flour and continue beating until it comes together. Finally fold in the pecans. The dough might be smooth. Shape the dough into 1 1/2 inch balls and flatten them slightly. Place them on a cookie sheet with about 1/2 inch apart. Bake them for about 15 to 17 minutes until golden brown. Transfer cookies to a wire rack to cool completely. Store in an airtight container. Enjoy the sandies with a glass of milk or a cuppa tea! After posting my sprouted wheat berry salad, I received a lot of questions as to what wheatberry is and where was it available. Since this is the first time I have been using using wheatberries in my diet, I would suggest visiting dear Dhivya's blog. She has loads of information about how to store, sprout and cook wheatberries and several other whole grains. I would say her blog is a one stop shop for all whole grain goodies! She even has umpteen number of whole grain recipes. Okay! Here is a soup recipe made with wheatberries. I adopted the idea of this recipe from here, making a few changes here and there. I sprouted the wheatberries and then added it t0 my soup and salad. I would say, it is absolutely delicious and there is no compromise for the taste as well as the nutrition. It is filling and makes a whole meal when had with a slice of your favorite bread. We had this for a weeknight dinner along with some garlic bread. So here comes the recipe! The photos do not do any justice to the recipe. So pardon my photos here..
Soak the wheatberries overnight and sprout them until you see small sprouts coming out. Wash the rajma and potato. Peel the potatoes. In a pressure cooker, boil together the potato, kidney beans and wheatberry sprouts together until about 3 whistles. Reserve the cooking liquid. Meanwhile in a pan, heat some oil and saute the garlic and onions until translucent. Add the celery and bay leaf and soft for one more minute. Mash the pressure cooked potato roughly. Then add the pressure cooked wheatberries, kidney beans and potato and saute for a minute. Add the cooking liquid and some water/vegetable broth. Stir in the salsa. You could replace this with tomato paste instead. Add the fresh basil leaves, salt and pepper. Cover and allow it to simmer for about 15 minutes. Sprinkle some cheese and serve with some fresh homemade bread! Lately I have been quite busy with my graduate classes, and have very little time to cook. So am looking forward to more of cook ahead recipes and frozen recipes. Please do feel free to give your suggestions on such quick cooking and cook-ahead meals! I made a huge batch of this soup and froze it. It freezes well and retains the same taste when thawed and microwaved. Also sending my Rajma Kurma for the event. After the series of Show Me Your.. Events, i am here with another edition of the event. I always feel that planning what to pack for your lunchbox is a more challenging task than actually even preparing your lunch. So this event should be helpful in bringing out ideas to plan a wholesome, nutritious and easy lunches. So let us put on our thinking hats and come up with various lunch ideas! Rules for sending your entries! Take a picture of your lunchbox/ tiffin box/ dabba/ brown bag or whatever you call it. You are welcome to show all contents of your lunchbag including the drink, snacks etc. This is not required though. 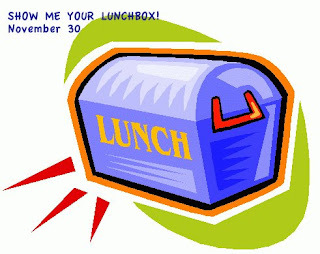 You are free to post just the picture of your lunchbox. Mention the lunch menu along with the picture. 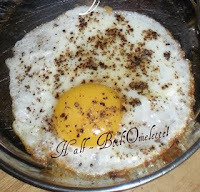 You are also welcome to share the recipes if you like. Recipe is optional. You can send in any number of entries for the event. Please link back to this announcement and repost old entries. Feel free to use the log. It is optional. Non-bloggers can also email me your entries. i will include them in the roundup. Last date for the event will be November 30. 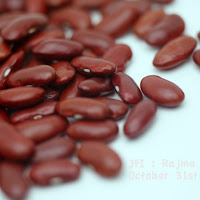 Do check out the previous editions of Show Me events..
Also send in your entries for JFI:Rajma before Oct 31st. I made a huge batch of these delicious healthy muffins. These make a great tasting snack or breakfast. I make a batch for the freezer and I pop one muffin for a few seconds in the microwave when am hungry. And they are ready moist and fresh again. I made it healthier adding oatmeal to the batter. I also love that it is eggless. Combine the dry ingredients together - the flour,oatmeal, brown sugar, baking soda, baking powder and salt. In another bowl combine together the milk, applesauce and vanilla essence. You could replace the applesauce with oil. Also combine the mashed bananas. Finally combine the liquid and dry ingredients and stir until just combined. Over stirring results in hard muffins. Line the muffin pan with muffin cups. Grease them if needed. Pour evenly about 3/4th full. Bake in a preheated oven at 400 F for about 20 to 25 minutes until a toothpick/fork inserted comes out clean. Cool for about 10 minutes and transfer to a wire rack. 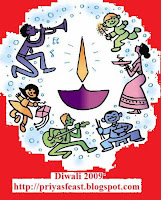 Wishing you all a Happy Diwali!! I have heard a lot about whole grains, sprouts and their nutrition. But I have always been skeptical to try them. On our trip to the grocery store, I picked a pack of wheatberries and it was lying in my pantry for a while. Googling for recipes, I came across a lot of salads and soups with wheatberries. I learnt that its nutrition is maximum brought out when sprouting the berries. So I sprouted a cup of wheatberries and moong dal separately. Then I prepared a quick salad and we had it with a piece of bread to make a wholesome nutritious meal! Soak wheatberries and moong dal separately overnight. In the morning, drain the water wash them separately and place in a jar tied with a muslin cloth. Leave it overnight. In the morning you will see the berries and the moong dal sprouted. Wash them and follow the same method if you want them to sprout even longer. Pressure cook the wheat berries and the garbanzo beans. You could use canned garbanzo beans instead. The wheatberries should get a chewy texture. Combine together, the wheatberries, sprouted moong dal, carrots, cucumber, raisins. Season with a dressing made with olive oil and balsamic vinegar. Also add salt and pepper to taste. This tastes so good and kept us full for hours. 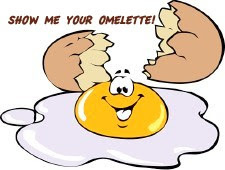 Finally, here is the roundup of Show Me Your Omelette event! 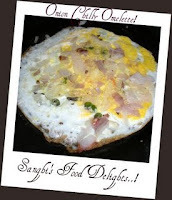 I received delicious omelettes which can be had for breakfast, lunch and even dinner! This page is worth bookmarking for all your future references I guess! Thank you everyone for all your beautiful entries! And while I was thinking of ideas for my next Show me Your... event, I was not able to finalize upon any one topic. So it would be great if you come up with any great ideas for my next Show Me Your.. event!! Knowing the health benefits of the whole grain ragi, I try to tweak in ragi once in a while in our weekly menu. You can check here for more uses of ragi flour. I make ragi puttu or ragi kozhukattai for snacks in the evening. It can be made with sugar or can be made more healthy when made with jaggery. Roast the rice flour and ragi flour together for about two minutes. Then add the sugar, shredded coconut and cardamom powder and mix well. Add a little water or milk and knead to form a a thick dough. Take some dough about the size of a lemon and clamp it in between your fingers so that the dough stays in shape. Steam it in a rice cooker or idli cooker for about 12-15 minutes. If using jaggery, boil the jaggery in a little water to form a syrup. Strain the liquid and add it to the flours and mix. Consume immediately, if you have leftovers, steam it again because it tends to harden after a day. Also am very proud that my omapodi/sev recipe has been chosen among the top 9 in the FoodBuzz community today! Do check it out! Food For 7 stages of life:Kids initially started by Radhika . This is crunchy and quick tea time snack. It is versatile and is used in several dishes. It is used as a topping or to garnish almost all chaat foods. It can be had plain or spiced with some chilli powder and roasted curry leaves. This is prepared at home during festivals like Diwali. Here is the recipe for crunchy and melt-in-the-mouth omapodi as prepared by my mother-in-law. Soak the omam/ajwain in warm water for about half an hour and strain the liquid. Combine all the other ingredients together and add the strained omam water. Knead together to form a smooth dough. Add little water if needed. In a heavy bottomed vessel, add oil for about 2 inches deep. Fill a murukku/ omapodi presser with the dough and squeeze in required quantities into the hot oil. Lower it to medium heat. After a minute flip the omapodi to the otherside carefully. Once the bubbles subside and both sides get cooked completely and turn to golden brown color, remove it with a slotted spoon and drain on paper towels to drain the excess oil. Garnish with curry leaves roasted in oil/ghee if needed.